Subscribers are like armchair supporters for a football team. They watch the games, and occassionaly buy a t-shirt. But members are those who actively want to be involved themselves. 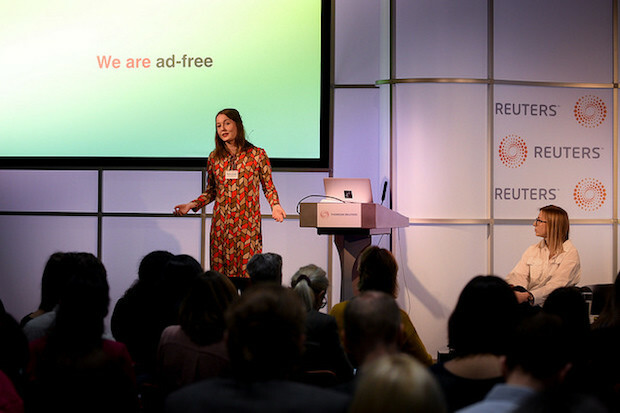 This is how Maaike Goslinga, international editor, De Correspondent, highlighted the difference between building a subscriber base and setting up a membership scheme for a media organisation, speaking at the newsrewired digital journalism conference on 7 March alongside Jessica Best, engagement editor at De Correspondent. "We have been a membership-driven media from the start and found it is a crucial part of the operation, something that we learned along the way and we're still trying to perfect," said Goslinga. "People want to contribute, they of course want to support the website with money but they surely also want to do it with time." There are several ways De Correspondent enables members to share their expertise with journalists, including public reporter notebooks, debates, and having a Rolodex of verified experts among their member base who journalists can contact. De Correspondent, which launched with a record-breaking corwdfunding campaign in 2013, now has about 60,000 members paying €60 per year each, and 47 full-time staff. It is primarily funded through membership, but it has also developed additional revenue streams such as in-house book publishing. At newsrewired, Goslinga and Best shared lessons from De Correspondent's work with members and their recent efforts to expand into an English-speaking market. "We treat members as curious individuals who actively participate. We found that our members know more than one healthcare correspondent or one economy correspondent so we treat them as people who want to share their knowledge with us. Everything we do in our journalism process is optimised for letting people in," Goslinga explained. As an ad-free media organisation, De Correspondent does not have to track users in order to gather data for advertisers. The organisation also operates with transparency at its core, both in its journalistic process and in the way it shares its financial activities. "Readers know if you just say you're engaging with them instead of actually doing it. We found that a lot of newsrooms are still trying to grasp this concept and that's fine. "But if you're serious about it, build it into your entire editorial process and don't just leave it up to one or two reporters to work with members and membership. "This is part of the trust crisis in journalism, that people don't feel they're being taken seriously," Goslinga said. Working closely with members has also resulted in stories De Correspondent might not otherwise have been able to publish. Engagement helped its energy and climate correspondent unearth Shell documents that led to an investigation published in partnership with the Guardian. Collaborating with its members also enabled De Correspondent to better portray the lives of refugees settled into The Netherlands, as 300 people stepped up to contribute with stories of refugees living in their own communities, and to build connections between them and the journalists. However, a workflow that keeps members involved and goes beyond the buzzwords of audience engagement can be time consuming for a media outlet, explained Best. "Our reporters spend up to 50 per cent of their time engaging with members," she said. In order to establish better roots for its English-language edition, De Correspondent partnered up with Studio 20 at NYU for the Membership Puzzle Project, looking at membership efforts in media organisations around the world. Membership programmes have been established at outlets large and small, from the Guardian to local outlets such as The Bristol Cable in the United Kingdom or City Bureau in Chicago. The percentage of revenue that comes from memberships varies widely among the organisations the Membership Puzzle Project looked at, and so does the extent to which members are involved with the daily running of the operation. But those that had a successful membership programme all had one thing in common. "Organisations that have really robust relationships with their members have membership values right at the core, and those values are mission-driven journalism, transparency, and a commitment to ongoing collaboration with the people who read your work," said Best. "Your tote bag will not save you, you need to foster belonging not exclusivity," she added, explaining how the idea that membership schemes had to be centred around exclusive perks or access was somewhat misguided. "The research we've done has found that actually most paying members of news sites all around the world are motivated by an idea of shared responsibility, a notion that they think this project should exist, that's why they pay for it. "Perks like tote bags or mugs really come very low down the list, and they're also expensive and time consuming for news organisations to manage. "But even more interestingly than that, what a lot of people say is that exclusive access to a news product is the thing they value the least."